On Fiji Time – These Two Eyes! I woke at 7:45 am to the sound of the ocean lapping against the shoreline, but it wasn’t coming from a sleep machine. This must be a dream, I thought to myself as I stared out at paradise. Stepping outside my small one bedroom bungalow at Mantaray Island Resort, I walked down the five steps to where the sand greeted my toes. Just days before I had arrived in Nadi on Viti Levu to grey skies and endless rain. I feared that a cyclone would touch down again and cancel my trip just as it did this same time last year however luck would have it that by day 3 my fears were washed away with the rain and the sun shined its face high. Steph and I spent our first night on the mainland at Smuggler’s Cove, budget accommodation with a happy medium of backpackers and couples. For the short time we were there we sipped pina coladoas and Fiji Bitter in the Ghostship Bar & Grill and watched the slanting rain come down against the back drop of crystal blue water while two young local girls performed a traditional dance. After an early rise the next morning we joined Awesome Adventures Fiji to make our way to the small group of islands known as the Yasawas. Sailing the open sea, eyes wide we observed the small bits of land scattered throughout the South Pacific Ocean with palm trees stretching to the sky. 3.5 hours later we disembarked at Mantaray Island Resort on Nanuya Belavu Island. As our small transfer boat approached the land, men in brightly colored hibiscus shirts strummed an island tune and serenaded us with a welcome song. 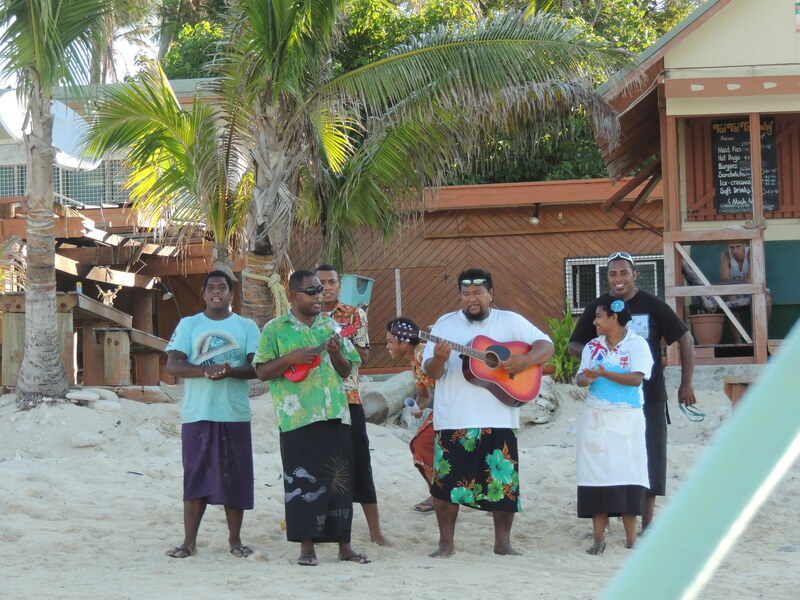 We walked ashore and were greeted with a very loud “bula,” which means everything from hello to welcome to life. Yup, this is going to be good. For two and a half days it was pure relaxation. The sun came out and we spent our time snorkeling from out-front our jungle bure, reading, swimming, tanning, kayaking and napping in the shade of the palm trees on hammocks. 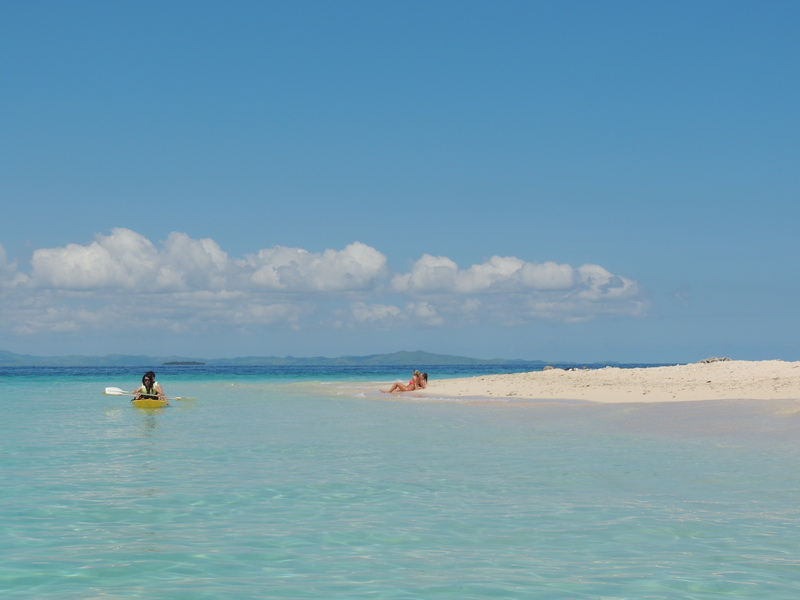 The water was so clear under our kayaks we could see the reef and an array of fish in every color of the rainbow. One of the Fiji islanders took fresh coconuts from a tree, where he then forced each one against a wood stick to remove the outer shell. After, he took the inner coconut and sawed off each end to create a hollow piece. At that point I took the coconut and rubbed it against mud on a flat rock to remove the hairy bits. Once done, my local Fijian scrapped the coconut out from the inside then told me to rub it with the coconut oil after sanding it smooth. And that’s how I created my coconut bracelet. At lunch we dined with fellow travelers sharing stories of our whereabouts. 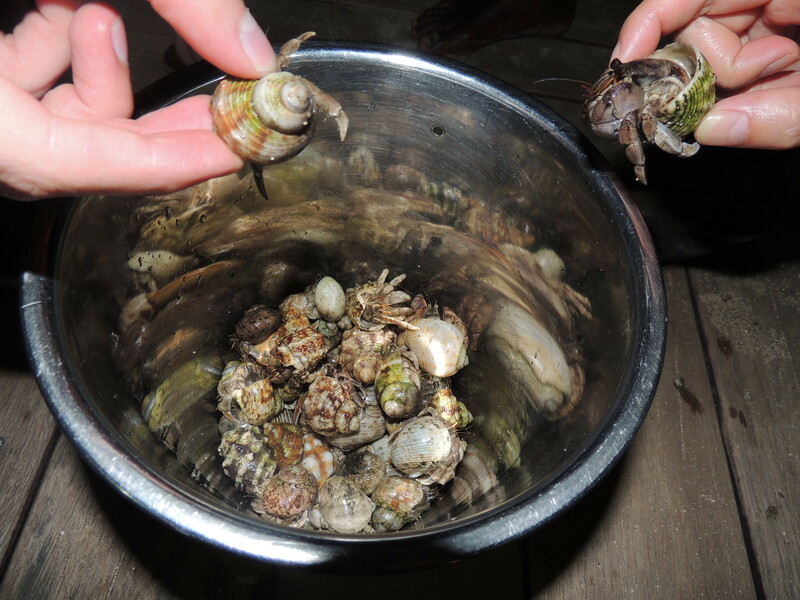 The evenings were fairly laid back but the ultimate highlight was partaking in hermit crab races. Initially when one of the staff asked who would like to partake in crab races I said no way. I don’t want to get on all fours and crawl around the sand but once I realized it was with real crabs I got so excited it was a no brainer. Unfortunately for me, my little guy pinched me twice and therefore I dropped him. When it came time to race he didn’t even budge from his shell. Steph had better luck with hers, but then he decided to hide in his shell a mere centimeter before crossing the finish line. I would put Mantaray Island on my list of must stays. Between the hospitable staff, excellent food, beautiful beachfront bures, eco-friendly compost toilets and a mix of young and old I’d go back in a heartbeat. But, it was time for us to move on and we made our way from the upper island group the Yasawas down to the Mamanucas. Beachcomber Island is only 19 kilometers from the mainland however once on the tiny island a quick 10-minute walk and you can master its circumference. Known as “the party island” of Fiji, we couldn’t call it a true holiday until we experienced the madness with our own eyes. 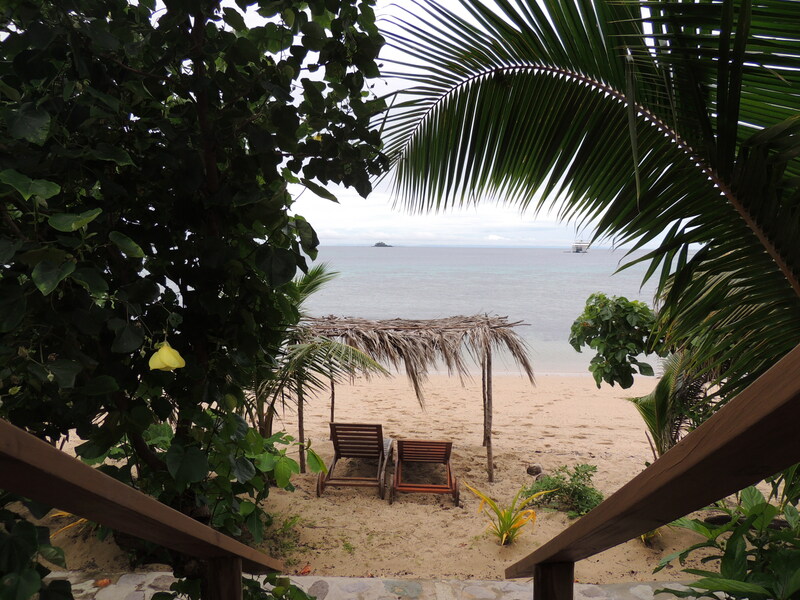 Our private Coconut Bure was a good call over the alternative of a 100-person dorm. As expected, the meals were below average and the crowd was a young backpacker scene with day-trippers from the mainland trickling in during the afternoon. 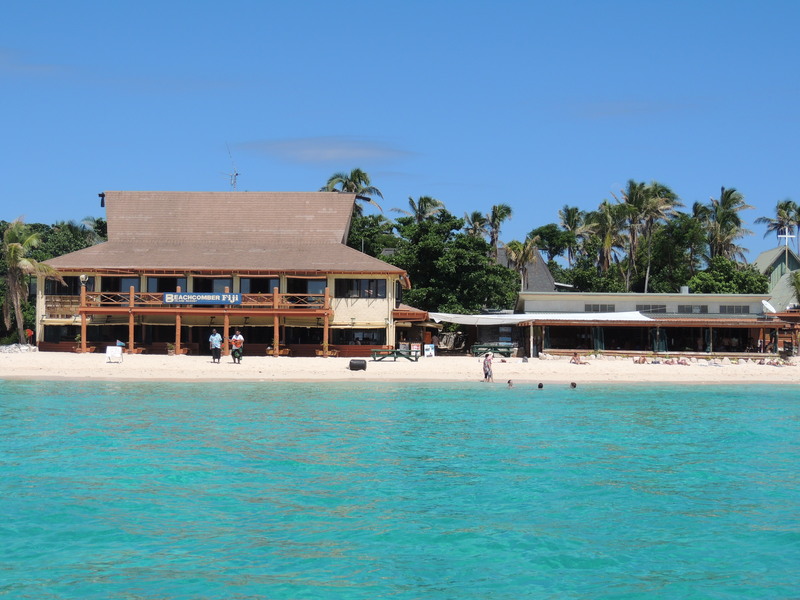 In fact, I’ve encountered more American tourists in Fiji then anywhere else in the Pacific. Despite it being a bit quieter then anticipated, the staff did its best at night to liven up the guests with live music, drinking games, and we even learned the synchronized dance called the bula dance. The ocean was clear blue and the sun strong. Unlike Mantaray however, there was no option to get shade. We joined the free snorkel trip out to the reef with a group of tourists. As I nervously entered the water and swam away from the boat towards the reef I couldn’t help but think about sharks. No surprise there. As I was contemplating whether a shark would likely go for my leg and give the boat enough time to save me, or just take a chunk right out of my side and finish me off I couldn’t help but smile inside my snorkel mask as beautiful fish swam under me and large, bright purple starfish stuck to the coral. I decided I saw enough and made my way slowly back toward the boat when one of the girls in our group was frantically making her way toward the boat as well. I didn’t like her look of panic so also began picking up my pace. Seconds later she confirmed, shark! That’s all it took for me and I was at the boat seconds later asking to be picked up out of the water. Our guide said we still had five minutes to go, no rush, but I said I want out now! Turned out to just be a 3-foot reef shark however that was enough for me to confirm my suspicions. Shortly later we joined another excursion to feed the fish and observe the coral in a glass bottom boat. Although we were just throwing bread into the water, thousands of small fish swarmed the boat in frenzy. 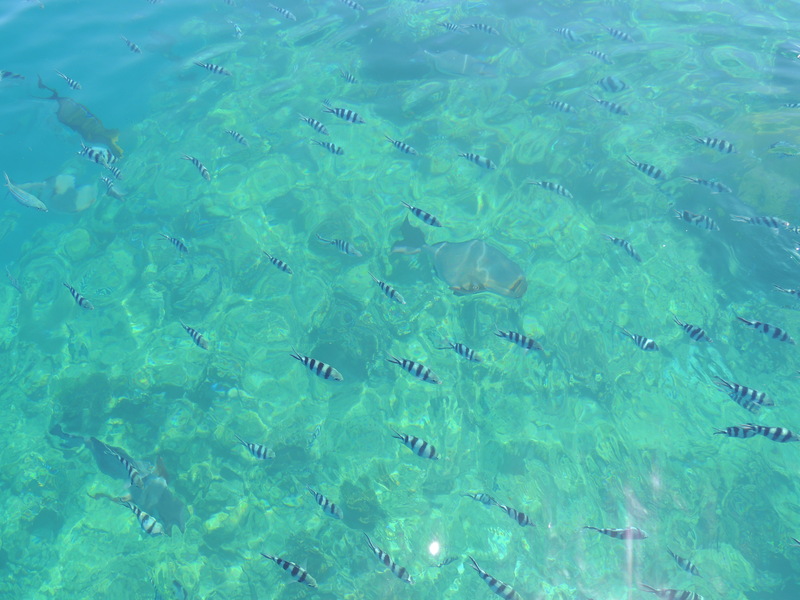 The little black and white stripped angelfish in formation would swim toward the bread, then leave in a mass rush once larger fish approached. It was very fascinating to observe. The one disappointment from the trip was that I never was able to visit a local village. Although these tours were offered at both resorts, they needed a minimum of 4 or 6 people to go. I wasn’t sure if the tours not running were partly due to “island time” or the unfortunate fact that when you surround yourself with budget backpackers, Steph and I seemed to be the only takers interested in shelling out the cash. It’s a shame because on these visits you see where the locals live, visit the children in their school, and also can purchase handmade crafts. Also, the tour leaving from Beachcomber made a stop to Monuriki, the island the movie Castaway was filmed. 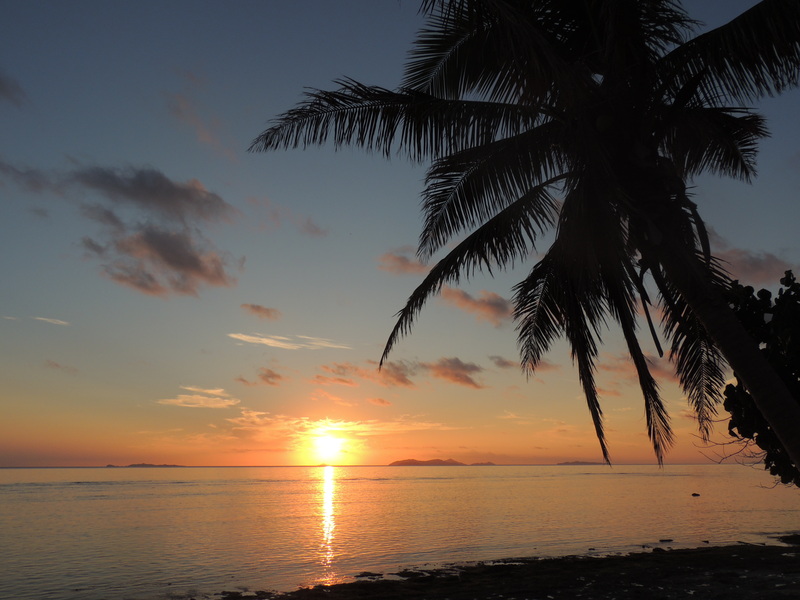 On our last night we walked toward the far side of the island, drinks in hand, relaxed in a lounge chair and watched the sky change from blue to crimson orange to black as the sun set. It was magical. The locals are one of the most beautiful, friendly people I’ve engaged with. Coupled with fantastic scenery, Fiji has been on my must-do list for years, and I’m so happy I finally was able to make that dream become a reality.